Finding the time and the motivation to start an exercise program can be difficult. The number one reason that most people give for not exercising is that they can’t find the time. The key to finding time and staying with a fitness program is to find something fun and the incentive to keep doing it. For Hawaiian Paradise Park resident, Suzanne Swanson, the motivation came from giving birth to her third child and the trouble associated with losing the weight. The stay at home mom also decided to home school all of her children which resulted in her having trouble making it to the gym on a regular basis. “I could only get to the gym twice per week and I knew I needed an additional workout, so I began running on the weekends,” she said. The decision to supplement her workouts with running was made 13 years ago and Swanson is now a regular fixture jogging around Hilo Bay or close to her home in HPP. Swanson grew up 90 miles north of New York City in the town of Kingston and moved to Oregon at age 19 where she met her husband. The couple then decided to come to Hilo in 1993 to raise a family. “I didn’t play any sports while in high school, instead I was a band person” Swanson said. With age and a total of five pregnancies Swanson realized that she needed to find the time to do regular exercise in order to maintain a healthy weight and lower her risk of a variety of ailments. 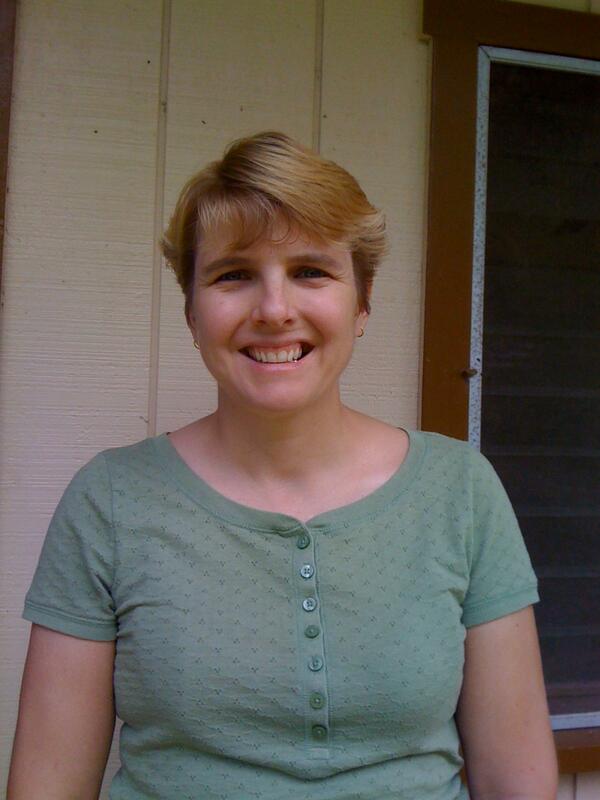 “I stayed at home for 18 years to raise and home school my children, and then last September I went back to work as a full time receptionist/bookkeeper for Ohana Counseling Services in Hilo,” she said. Since that time Swanson has participated in a variety of community runs and can now boast of breaking 30 minutes for a 5K (3.1-mile) race. In January she participated in the Hilo to Volcano relay race (31-miles) with two other women and the team crossed the finish line under six hours. Through all the changes to Swanson’s busy life she has consistently used running as a ‘fall back’ activity as she finds that it works well with her ever changing schedule. Swanson will run three times per week with distances varying from 2.5 miles to 4 miles, depending on where and how she feels. She will also watch what she eats to maintain a healthy, well balanced diet. The Swanson family will rarely eat out and they try to stay away from processed foods. “My four kids all help with the cooking so we tend to eat a lot of basic, old fashioned meals,” she said. This busy mother, with a full time job, has also raised the bar in her goal setting as she looks for a variety of ways to stay healthy and fit. Swanson continues to make the most of her situation and continues to challenge herself in the battle of gaining age related weight. Her goals are simple and obtainable and her biggest competitor is herself. Swanson is a good example of an average, everyday person, who sets her first priority on her family while looking for ways to maintain a healthy lifestyle. 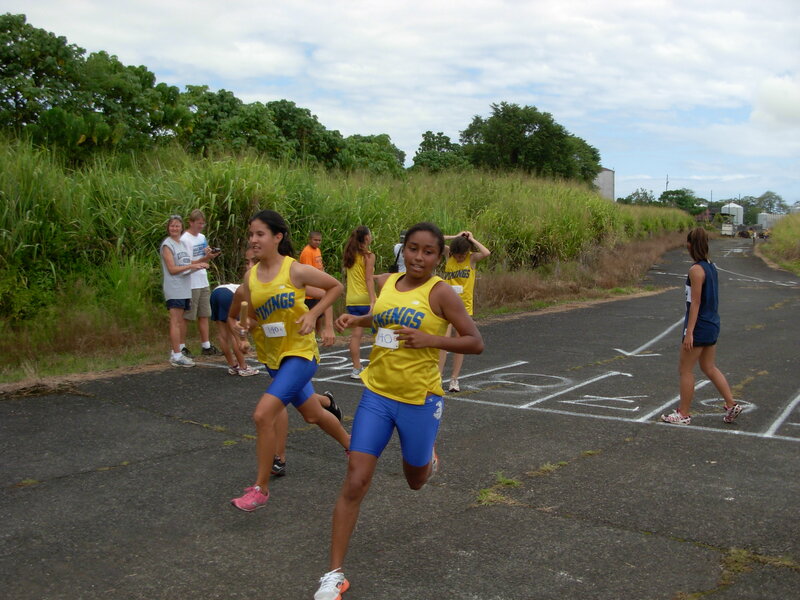 KEEAU-It was a breathless, fantastic finish for a pair of Hilo runners, each girl running glued together until one leaned ahead of the other at the end. The Big Island Interscholastic Federation opened its cross-country season with a pair of running events that zigzagged its way around the Christian Liberty Academy Campus this past Saturday. Using a format introduced by CLA coach Frank Grotenhuis the Canefire Conditioner required each BIIF school to pair their runners with each harrier doing three alternating one-mile legs. In the opening girl’s race it was Waiakea’s Kelsie Kobayashi jumping out to an early lead with the rest of the field in hot pursuit. Kobayashi ran her first mile in 6 minutes and 10 seconds with Hilo’s Shalila de Bourmont and Karina Lawrence following in at 6:21. During the exchange Kobayashi handed off the baton to partner Kara Paulachak while Lawrence was teamed with Nadia Ramirez and de Bourmont was paired with Carmen Garson-Shumway. The Vikings lead pairs stayed composed during the race and by the third mile found their top two teams running side by side in the lead. “We wanted to keep the leaders in sight during the first mile and then run all three of our miles consistently,” Lawrence said. “It surprised me when I caught up to Shalila and it helped because we started pushing each other as it was fun to run together,” Lawrence said. During the final leg Vikings, Ramirez and Garson-Shumway ran shoulder to shoulder as it appeared that neither wanted to outdo the other. Ramirez, a senior who transferred into Hilo after last year’s cross country season, leaned at the finish line to nip freshman teammate Garson-Shumway by a hair with both clocking in at 38 minutes 29 seconds. Hilo swept the top three pairs with Kaylee Rapoza and Raycee Cooke helping the Vikings to win the overall team scoring. 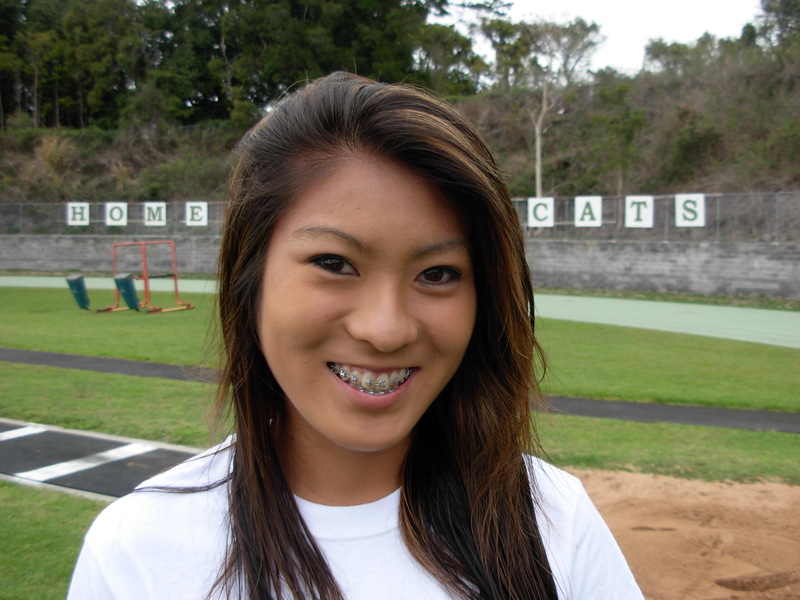 Honokaa’s Kelly Greenwell and Allie Shiraki took fourth with the duo of Kobayashi and Paulachak slipping to fifth. 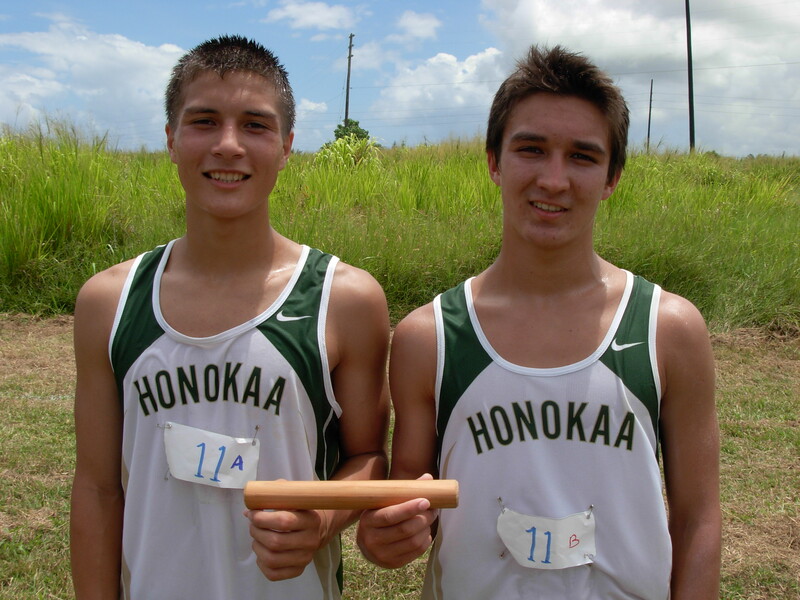 In the boys race it was the Honokaa duo of Joshua Robinson and Chayce Moniz leading from start to finish. Dragon star and BIIF individual champion, Chris Mosch, was still sidelined nursing a stress fracture that he received at the end of the track & field season in May. “I’m sitting this one out to give my leg a better chance to heal,” Mosch said. Last year at CLA Mosch teamed with Robinson to win the Canefire Conditioner, but this year Robinson needed to rely on Moniz if the Dragons were to repeat as duo champs. His strategy paid off as Moniz took the handoff from Robinson and then claimed the lead in his opening mile. “I was nervous before I ran as I felt a lot of pressure to do well today,” Moniz said. “I didn’t want to let anyone down, especially my partner. Moniz opened the gap and by the time Robinson took the second leg handoff the Dragons held a 100 yard advantage. The Dragon duo widened their lead with each ensuing handoff and left little doubt as to who would win the race clocking in at 31 minutes 46 seconds, more than one minute ahead of their closest rivals. 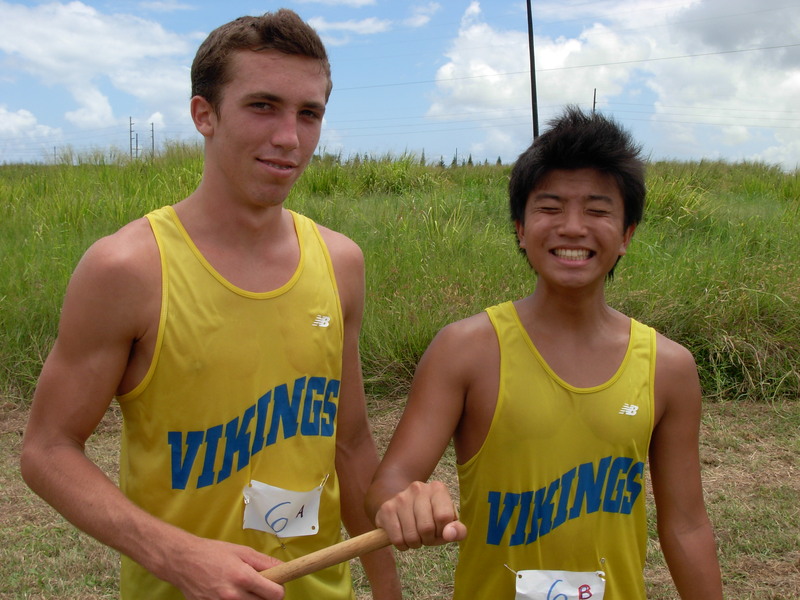 The Keaau pair of Wayne Pavao and Kevin Olsen made a final attempt to move into second place, but fell short by one second as the Cougars settled for a third place finish. Hilo finished in 32:51 with Keaau coming in at 32:52. In the team standings it was Honokaa taking first with Waiakea second and Hilo third. On Saturday the BIIF moves to an East/West format with Waiakea and Kealakehe playing host. Girls will begin at 10 am followed by the boys with each running the traditional 3-mile cross-country race. Michelle Wie tore up the 13th, 14th and 15th holes firing birdies on each and taking a three stroke lead in the CN Canadian Open in Winnipeg, Canada. Wie started the day in a tie at 10 under par and didn’t really get her game started until the par 5 13th hole where she used her long distance driver to put her into position for birdie. On the par 5, 14th hole, Wie hit her second shot into the sand bunker, but placed the ball to within 20 feet on her third shot before draining another birdie. On the 15th hole Wie put the tournament out of reach by dropping another birdie and moving herself four strokes ahead of on the leader board. Wie is considered by many, me included, to be the Tiger Woods of professional golf and a key person that will bring life back into the LPGA. The six foot tall, Hawaii born, 20 year old is the darling of the women’s circuit and has now won her second tour victory. Wie was tied for first after the third round with Jiyae Shin at 10 under. Shin had an up and down final round and finished with a bogey on the 17th hole to drop her in a group at 9 under for the runner-up position. Wie also bogeyed the 17th, but still won the Canadian Open by three strokes. Wie led the Open for 68 out of 72 holes, winning by three strokes over her closest competition. Michelle Wie shot an even par 72 to put herself into a tie with Jiyai Shin going into the final round of the CN Canadian Women’s Open golf championship in Winnipeg, Canada. Wie held a three shot lead going into today’s third round but had problems on the putting green to lose her advantage while Shin fired a 69 to erase the gap. Both women finished the third round at 10 under par with a 206. Wie, only 20 years old and a Hawaii native, is the darling of professional golf and has had an enormous following since breaking into the professional circuit. Shin and Wie will be paired in Sunday’s final round and are four shots ahead of South Korea’s Jee Young Lee and Na Yeon Choi, along with Suzann Pettersen of Norway who is the defending champion at 6 under par. Following in a tie for 9th is Paula Creamer and Morgan Pressel at 212 with Cristie Kerr, Christina Kim, Kristy McPherson and Karin Siodin tied for 11th at 213.